Ecologically and economically optimised processes with minimum quantity cooling lubrication go along with longer tool life. Due to concentrated lubrication at the cutting edge, the friction is considerably reduced, so cooling approaches such as flood cooling are no longer applicable. Thermally relieved cutting edges mean a longer tool life at increased feed rates and reduced cutting speeds. The atomization of the lubricant into micro-particles results in a much better wetting and distribution of the lubricant when spraying at a workpiece surface and also achieves a high increase in the lubrication's effect. This can be compared to fog droplets on a window pane which uniformly adhere in contrast to raindrops immediately rolling off after impact. Even under high pressure on the workpiece the microparticles adhere. Through the press force they extend their surface thus increasing the lubrication effect. The DATRON EK-D Cooling/Lubrication System for ethanol is suitable for spindles with direct shank clamping. Ethanol is sprayed through two nozzles onto the workpiece and the tool. The thermal energy generated during milling is withdrawn in the evaporation process. Additonally, ethanol lubricates the flute of the tool, thus increasing its service life. Cleaning the workpiece after machining is not neccessary due to the complete evaporation of the ethanol. The DATRON EK-VM-R spray system consists of a spray head with four nozzles. Their setting angles are precisely set, so the milling cutter is optimally sprayed. The round spray head is only used in combination with HSK-E 25 spindles and specifically designed for the CleanCut functionality, the rotary-swivel table andDATRON M7 or M10 machines with an 11fold tool changer. The DATRON EK-VM-4spray system consists of four adjustable nozzles with a bundled jet, that are arranged 90° apart around the milling cutter. The spray head can be used instead of the EK-VM-2 standard head. With the EK-VM-4, the coolant/lubricant is optimally distributed. The coolant always gets to the tool cutting edge, irrespective of the milling direction. The DATRON EK-VM-2 2-nozzle spraying unit features a cooling jet, that can be optimally adjusted to the machining task with flexible jointed hoses. This spraying unit is designed for all spindles with direct shank clamping and with HSK collet chucks. 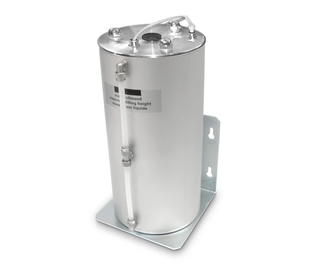 The DATRON Storage Tank With Filling Level Monitoring VBF is a robust metal tank for the standard cooling/lubricating system DATRON EK-D. This storage tank with five litre capacity is fastened directly to the machine. An automatic filling-level check with an visual warning displayed via the control guarantees process safety. The storage also features a visual filling check.